What a blessing it is to partner with Janet Tatz, our very knowledgeable and faithful Jewish mentor at Intermountain. 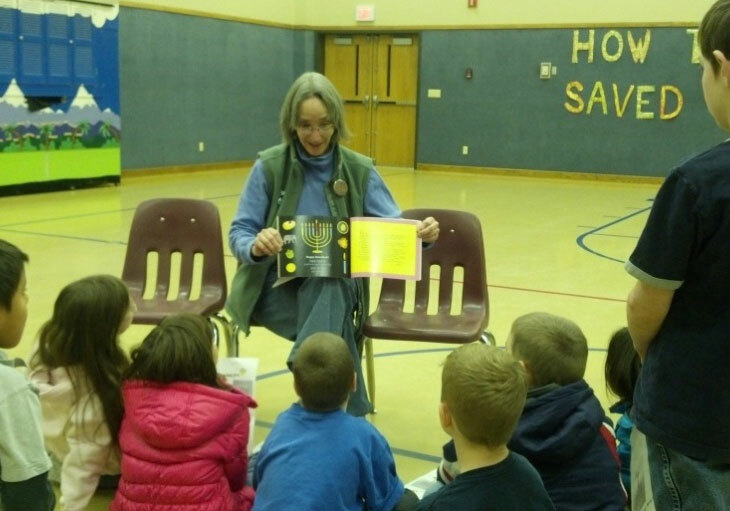 Janet had served alongside previous chaplain, Dana Holzer, for a number of years as a volunteer mentor, and then in the last few years as part-time staff. Whenever there is a Jewish child on campus that needs instruction and mentoring in their faith, Janet goes above and beyond to make sure that the spiritual and cultural needs of that child are met. We also get to work together on joint activities, like the observance of Hanukkah in chapel for all the children. On December 11th and 14th, both the younger group and the older children were able to learn about the holiday, eat some traditional desserts shared at Hanukkah, sing songs [see “Hanukkah Song Sheet” on resources page], and play dreidel! Q: Janet, what is the most rewarding part of working with the Jewish children on campus at Intermountain? A: It is very rewarding to see the Jewish students at Intermountain grow in their understanding of and appreciation for the Jewish traditions, prayers, teachings, holiday celebrations and customs. Our Jewish faith serves as a medium or bond between the children and their parents and helps reconnect the family in a very positive way. Q: What can you tell us—those of us who may not know much about the holiday—about Hanukkah and the traditions we shared with the children at Intermountain? A: Chanukah is an eight day holiday that begins on the 25th day of Kislev, on the Jewish calendar, each year. We celebrate the victory of a small group of Jews, including the Maccabee family, who fought off the Assyrian-Greeks in a battle that lasted three years ( 168-165 B.C.E. ), in order to retain their Jewish identity and practices. This was the first time, in recorded history, that a people stood up for their rights, and it is a cause to celebrate, even today. When the Jews returned to their Temple, in Jerusalem, that had been trashed and defiled by the Assyrians, they could only find one small crucible of oil to light the menorah that was lit each day in the Temple. One of the miracles of the Chanukah story is that this little bit of oil lasted eight days ~ the exact time needed to prepare, purify and bless a new batch of oil. 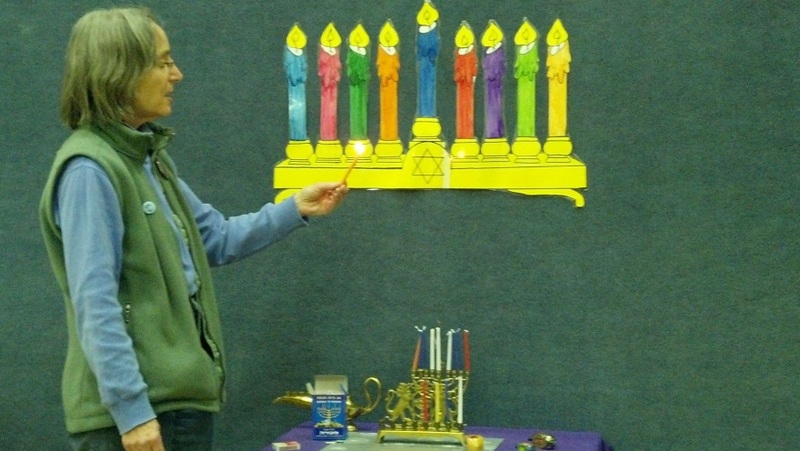 Accordingly, Chanukah is celebrated by lighting a nine-branched chanukiyah ( candelabra). Each night, an additional candle is lit, adding more light to the darkening days. During our Fellowship session, the children heard Chanukah stories, learned a couple of Chanukah songs, played the dreidel ( a spinning top that tells the story of Chanukah) game and enjoyed sufganiyot ( jelly doughnuts) which is also part of the traditional celebration of Chanukah. 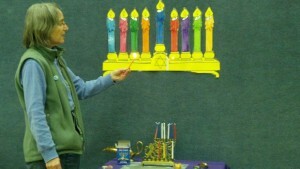 Also known as The Festival of Lights, Chanukah is a time to celebrate with family and friends. It is a joyous holiday. Q: Do you have a favorite Hanukkah memory you would like to share? A: I like everything about Chanukah! The smell of latkes ( potato pancakes) cooking on the stove; watching the candles glow in the menorah; singing Chanukah songs; spending time with family and friends. Chanukah reminds us of the power of hope and faith and is a message that still rings true, after more than 2100 years. I especially like recognizing that as I light my menorah and say the blessings over the candles here in Helena Montana, Jews around the world are all doing the same thing. Q: What hopes do you have for the Jewish mentoring and chaplain’s program as we move towards having a permanent chapel space on campus? A: The Chaplain’s program and, in particular, the Jewish mentoring program, has met in a variety of venues on campus over the years. After one of the older cottages is “repurposed” we will be able to have a “home of our own” as part of the newly developed multipurpose building that will house our program.